The combination of blues, tans and whites throughout the suite imbue the space with associations to the natural world, offering respite from technology for soothing inner reflection. While undergoing a PET scan, it is of primary importance that the patient be relaxed and comfortable in their environment, as anxiety will heighten their metabolic state and skew results. To that end, kpb architects’ interior design team worked closely with their architects to create a PET/CT suite that would reflect a comforting and positive influence on the client. 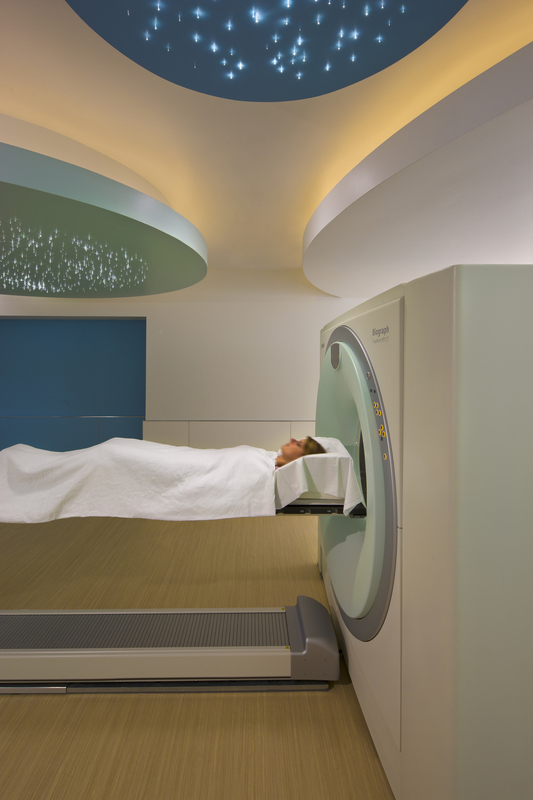 During the PET/CT procedure, patients look directly at the ceiling. Given this condition, the ceiling design was the focus in the scanner room. Fiber optic lights, in conjunction with circular soffits painted in shades of blue, create an interesting background for patients to look at during their procedure. Views of nature from the patient rooms provide a welcome distraction in an effort to reduce stress and encourage positive feelings. By centering the design of the suite on the patient experience, the space enhances the care and comfort offered by the hospital and its staff, and supporting the healing environment.